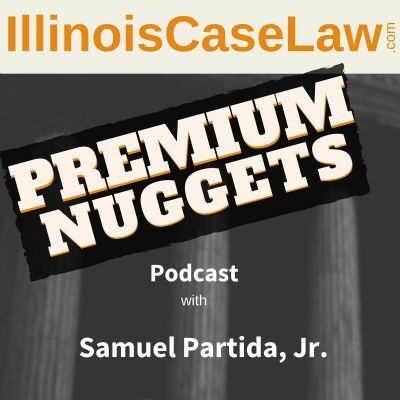 Episode 469 (Duration 26:45) Here's a quick summary of Illinois cases that deal with non consensual, forceable, warrantless blood draws. There were actually 3 consolidated cases each of them turning on whether or not the state could criminalize the failure to comply with implied consent laws. Two defendants were threatened with prosecution for failure to give blood; one defendant was charged for not blowing. Thus, success for all three petitioners depended on the proposition that the criminal law ordinarily may not compel a motorist to submit to the taking of a blood sample or to a breath test unless a warrant authorizing such testing is issued by a magistrate. If, on the other hand, such warrantless searches comport with the Fourth Amendment, it follows that a State may criminalize the refusal to comply with a demand to submit to the required testing, just as a State may make it a crime for a person to obstruct the execution of a valid search warrant. SCOTUS, then had to determine if the searches demanded in these cases were consistent with the Fourth Amendment. This is so because when a law enforcement officer claims authority to search a home under a warrant, he announces in effect that the occupant has no right to resist the search. If such warrantless searches are constitutional, there is no obstacle under federal law to the admission of the results that they yield in either a criminal prosecution or a civil or administrative proceeding. The court applied the search incident to arrest doctrine and noted it is a categorical rule. But McNeely concerned only one exception to the usual warrant requirement, the exception for exigent circumstances, that exception has always been understood to involve an evaluation of the particular facts of each case. Here, by contrast, the search-incident-to-arrest exception is at play. Having assessed the effect of BAC tests on privacy interests and the need for such tests, the Court concluded that the Fourth Amendment permits warrantless breath tests incident to arrests for drunk driving. Blood tests are significantly more intrusive, and their reasonableness must be judged in light of the availability of the less invasive alternative of a breath test. Thus, the police generally will need a warrant to get blood from a driver. The court said there must be a limit to the consequences to which motorists may be deemed to have consented by virtue of a decision to drive on public roads. Because breath tests are significantly less intrusive than blood tests and in most cases amply serve law enforcement interests, the court said that a breath test, but not a blood test, may be administered as a search incident to a lawful arrest for drunk driving. As in all cases involving reasonable searches incident to arrest, a warrant is not needed in this situation. Police arrive to the scene of motorcycle accident. Defendant’s leg was broken because his foot was “almost upside down.” He wiped out on his motorbike. Defendant’s speech was slurred, his eyes were red, and he had an odor of alcohol emitting from his mouth when he spoke or yelled at the police. Defendant appeared agitated by the presence of law enforcement. When Webb asked defendant if he wanted to go to the hospital, defendant refused. Emergency medical services (EMS) personnel who were present at the scene told Webb defendant needed to go to the hospital and requested Webb’s assistance. Although defendant continued to decline medical services, Webb ordered defendant out of the Jeep. Defendant refused. Thereafter, Webb and another officer physically removed defendant from the Jeep, placed him on a gurney, and assisted EMS personnel in putting the gurney into the ambulance. Webb reiterated that it was EMS personnel who wanted defendant to get medical treatment and that he did not direct anyone to treat defendant. When asked. Webb testified that the ambulance stopped after traveling one or two blocks because defendant was trying to get out. EMS personnel again asked the police to help in transporting defendant. Webb stated that he was concerned at this time for the safety of EMS personnel, defendant, and himself. Webb placed defendant on the gurney, handcuffed him, and rode in the ambulance the rest of the way to the hospital. Webb then assisted EMS personnel in taking defendant into the emergency room. At the hospital, Webb read the statutory “Warning to Motorists” to defendant and asked him to consent to blood or breath testing. At that point, Webb issued defendant a citation for DUI. Webb stated he did not take a sample of defendant’s blood nor did he direct anyone at the hospital to do so. Defendant briefly stated that, at the hospital, he never consented to have his blood drawn. Every time he was asked to have his blood drawn, he refused. Medical staff set his leg, which was broken. Where a person performs a search independently of the police, the search is considered a private one and, because state action is not present, the fourth amendment is not implicated. Where a search is conducted by a private individual, the search will be subject to constitutional guarantees when the individual conducting the search can be regarded as acting as an agent or instrument of the State. Participation by the police in and of itself, then, does not automatically invoke the application of the guarantees against unreasonable government intrusions safeguarded by the fourth and fourteenth amendments. There was no evidence that any police officer, sought or encouraged a blood draw or was even aware that one had been done. There is no question police forcibly seized defendant and helped transport him to the hospital. But defendant has never challenged the legality of the seizure. His challenge is only to the legality of a search, i.e., the blood draw that allegedly took place at St. Anthony’s. On this record, there is no evidence that a blood draw even took place, let alone that a hospital employee was acting as an instrumentality or agent of police when it was performed. This blood draw was a private search that did not implicate the fourth amendment. Ladina Sykes and her two children were leaving a beach in Evanston when the car struck a wall in the parking lot. Sykes contends her conviction should be vacated because the police violated her fourth amendment rights by holding her down while a nurse forcibly catheterized her without a warrant. The paramedics took Sykes to Evanston Hospital, where a triage nurse assessed her condition. She was stable and had no complaints but didn’t know the date or time so was deemed to have an altered mental state. Dr. Patel examined Sykes and ordered a CT scan and blood and urine tests to determine why Sykes was in an altered mental state and to decide on a proper course of treatment. Officer Pratt was standing outside Sykes’s room when he heard her tell the nurse she had one alcoholic drink that evening. He went in her room and asked her if she had been drinking. She told Pratt she had not been drinking or taking any drugs. Pratt arrested her for driving under the influence, based on the odor of alcohol, slurred speech, bloodshot eyes, and overall demeanor. He did not ask hospital staff to obtain samples for him. Colleen Costello, the supervising nurse, asked Sykes for a urine sample. Sykes refused. Costello then decided to catheterize her. Costello said patients can refuse treatment unless, like Sykes, they have an altered mental state. When Costello began the catheter procedure, Sykes was combative, swinging her arms, kicking her legs, and moving her hips to resist catheterization. She also tried to get out of the bed. Costello called for assistance, and about nine people responded, including Evanston police officers Pratt and Magnas, who had been standing outside the room. Pratt and Magnas stood at the head of the bed and held Sykes down by her shoulders. Once Sykes was restrained, Costello extracted the urine with a catheter. The blood and urine tests were sent to the hospital lab. Sykes’s blood test showed she was well within the legal limit for alcohol, and her urine test was presumptively positive for cannabis and PCP. The fourth amendment applies only to government action. People v. Phillips, 215 Ill. 2d 554, 566 (2005). A search performed by a private person does not violate the fourth amendment. Additionally, the fourth amendment does not prohibit the government from using information discovered by a private search. Evanston Hospital staff did not perform the catheterization as the agents of the police. The test was ordered for medical purposes unrelated to any possible charges filed by the police. The fact that the officers were present, had placed Sykes under arrest, and were called on to assist did not turn the medical procedure into state action. They were in the room only because nurse Costello asked for their assistance restraining her so that she not injure herself or others. It was not unreasonable for the officers to come to the aid of a nurse seeking help with a patient who might harm herself and others. Moreover, the catheterization was not dependent on the officers’ participation. Thus, the trial court did not err in denying her motion to suppress the results of her urine test. 625 ILCS 5/11-501.2(c)(2) says in cases of death or personal injury a person shall submit to chemical testing. Birchfield v. North Dakota,136 S. Ct. 2160, 2174 (2016) has thrown the constitutionality of this section into question. In this case, Eubanks was arrested in connection with a hit-and-run accident that killed Maria and injured Jeremiah. The police had probable cause to arrest Eubanks for driving under the influence. At the police station, Eubanks refused to take a breathalyzer test or to submit to blood and urine tests. At 2:53 a.m., an officer took Eubanks to the hospital, telling him that he was required by law to submit to blood and urine tests. Eubanks was physically restrained by hospital security and a blood sample was taken at 4 a.m. The nurse then asked for urine, but Eubanks refused to urinate. The nurse threatened to catheterize him. As she approached him with a catheter, he urinated, and a sample was collected at 5:20 a.m. The samples were sent to the crime lab for analysis. Eubanks blood produced negative results for alcohol or any illegal substance, but his urine tested positive for cannabis, ecstasy, and cocaine metabolite. A warrantless search is per se unreasonable unless it is a search conducted pursuant to consent, a search incident to arrest, or a search predicated upon probable cause where there are exigent circumstances which make it impractical to obtain a warrant. The State bears the burden of showing the existence of exigent circumstances. Eubanks does not dispute that the police had probable cause to believe that he was driving under the influence. Rather, he argues that there were no exigent circumstances that made it impractical to obtain a warrant. More specifically, he argues that (i) causing death or personal injury to another individual does not constitute a per se exigency and (ii) the State did not sustain its burden of showing exigent circumstances in his particular case. See Missouri v. McNeely, 569 U.S. 141 (2013) (natural dissipation of chemicals in the blood is not an exigent circumstance). Under McNeely, section 11-501.2(c)(2) is unconstitutional on its face, insofar as it permits compelled chemical testing without a warrant in all cases where an officer has probable cause to believe that a driver under the influence has caused death or personal injury to another. The facts of this case are illustrative since they do not reflect any exigency that would have prevented officers from obtaining a warrant. Nearly three hours passed before he was brought to the hospital. They could have used that time to get a warrant. Defendant’s pickup truck collided with a motorcycle carrying two persons. The truck and motorcycle met at an intersection. The driver of the motorcycle, James McFall, was killed; his wife, Kasey McFall, sustained serious injuries. The expert calculated that the motorcycle’s speed at impact was approximately 25 miles per hour. The pickup truck’s speed was between 13 and 15 miles per hour at the time of the collision. “Black box” data recorder reflected that five seconds prior to the crash, the truck’s speed was approximately 10 miles per hour. The recorder indicated that the truck’s brakes were applied five seconds before the impact. The defendant was taken to the emergency room at St. James Hospital, where two blood samples were drawn from him. The first blood draw was taken pursuant to a physician’s order as a part of his emergency room treatment, at approximately 10:46 p.m. At the request of police, nurses performed a second blood draw for inclusion in a “DUI kit” shortly after midnight on July 3, 2011. Both tests indicated that the defendant’s blood alcohol content was above the legal limit. Officer Murphy stated that he gave a nurse a DUI test kit containing vials for blood and urine samples. He observed a nurse perform a blood draw for the DUI kit, which he placed into the evidence locker at the police station. Defendant’s various blood tests came back as .142 and .0118. The defendant was charged with 10 counts of aggravated driving under the influence of alcohol and reckless homicide. Before trial, the defendant moved to suppress the results of the second blood test used in the DUI kit. At a hearing on the motion, the defendant testified that at the hospital, he was asked for a blood sample “around three to four times” by nurses, in the presence of police. He stated that he “continually asked the reason why they wanted to draw blood” but was given no reason. He claimed that he never consented to the DUI kit blood draw. The trial court proceeded to find that the second blood draw was admissible under section 11-501.2(c)(2) of the Code. The trial court sentenced the defendant to two concurrent eight-year sentences on counts I and V.
The defendant argues that, because he did not consent and Officer Murphy did not attempt to obtain a warrant, the DUI kit blood draw violated his rights under the fourth amendment of the United States Constitution. The defendant argues that section 11-501.2(c) is unconstitutional in light of the United States Supreme Court decision of Missouri v. McNeely, 569 U.S. 141 (2013). In determining whether the exception applies, a court asks “the objectively ascertainable question whether a reasonably well trained officer would have known that the search was illegal in light of all of the circumstances.” See People v. Harrison, 2016 IL App (5th) 150048 (February 2016) (good faith exception applies to forced blood draws before McNeely). Harrison supports application of the good-faith exception under the facts of this case. As in Harrison, the defendant’s arrest in this case occurred after our supreme court’s decision in People v. Jones, 214 Ill. 2d 187 (2005) but before the 2013 decision in McNeely. We recognize that our recent opinion in Eubanks rejected the State’s reliance on Jones to invoke the good-faith exception. Although the defendant in this case testified that he initially refused requests for a blood draw, he did not claim (and there is nothing in the record to suggest) that he was physically threatened or restrained in order to obtain the sample. The trial court specifically found that he was not coerced, and that finding is not against the manifest weight of the evidence. As the good-faith exception applies in this case, we affirm the denial of the motion to suppress the DUI kit blood draw. The defendant, Chad B. Hayes, struck the boy with his vehicle when the boy rode his bicycle in front of the defendant’s vehicle. The accident took place near city hall in Sumner, Illinois. According to the defendant’s statement to police, one of the children attempted to hand the defendant a piece of candy to unwrap for him. The defendant looked back to talk to the child. As he did, his vehicle struck seven-year-old David Kirby. Apparently, the kid rode his bicycle between two parked cars onto the roadway. Witnesses did not believe that the defendant could have done anything to avoid the accident. The defendant ran into city hall asking for help. Several police officers responded to the accident, including Lawrence County Deputy Danny Ash, Illinois State Police Trooper Brooks Thomann, and Bridgeport Police Chief Scott Murray. The 7 year old victim died. Deputy Ash asked Chief Murray to transport the defendant to Lawrence County Memorial Hospital to provide blood and urine samples for drug screening. No one noticed anything about the defendant’s demeanor or appearance that would lead him to believe that the defendant was intoxicated. Chief Murray testified that Deputy Ash asked him to transport the defendant to Lawrence County Memorial Hospital for drug testing. Chief Murray did so. At the hospital, Chief Murray accompanied the defendant to the restroom while he provided a urine sample and remained with him while his blood was drawn. Chief Murray testified that he waited with the defendant until Deputy Ash arrived to transport him from the hospital. The test indicated the presence of methamphetamine, amphetamine, THC, and naproxen, and the defendant was charged with aggravated driving under the influence (DUI) (625 ILCS 5/11-501(d)(1)(F) (West 2010)). Chief Murray acknowledged that he did not give the defendant the warning to motorists. The results of initial tests performed by the hospital’s lab were faxed to Deputy Ash later that afternoon. After receiving these results, Deputy Ash placed the defendant under arrest for DUI. Deputy Ash asked the defendant to submit to a second drug test 2 days later. This blood tested negative for the presence of any drugs. Deputy Ash also issued two traffic citations to the defendant for failing to exercise due care (id. § 11-1003.1) and failing to reduce speed to avoid an accident (id. § 11-601(a)). Eventually, the defendant was charged with aggravated DUI (id. § 11-501(d)(1)(F)). The court sentenced the defendant to 54 months in prison. The question before us is whether the results of the drug tests should have been excluded because they were obtained in violation of the fourth amendment to the United States Constitution. 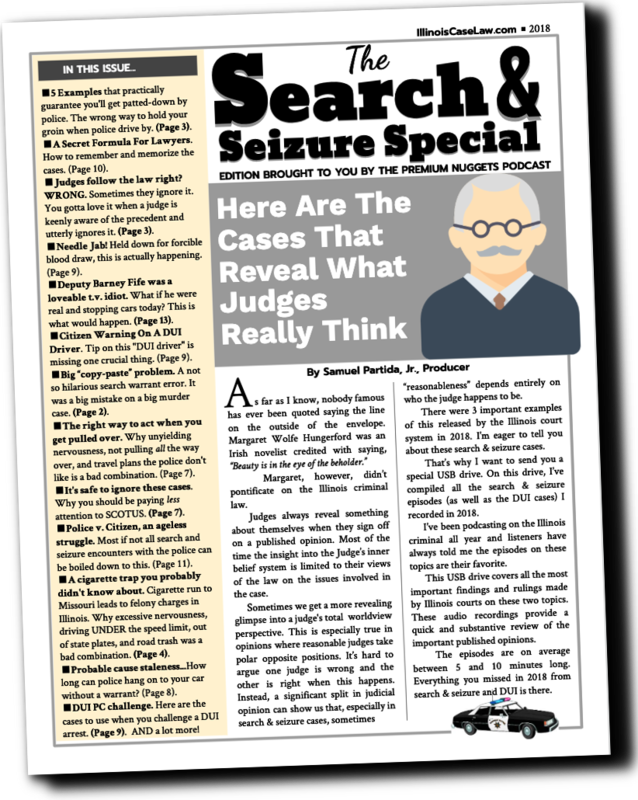 A recognized exception to the warrant requirement is voluntary consent to a search. The State argues that the defendant unambiguously consented to the search through his conduct by getting into the vehicle. The State further argues that his consent was voluntary because there was no evidence that he objected to the request that he submit to the test. But here, the record contains no evidence at all concerning how the test was presented to the defendant or how the defendant responded. We do not know whether Deputy Ash asked the defendant to take the test or demanded that he do so. We do not know whether Deputy Ash told the defendant that he had no right to refuse the test. We do not know whether the defendant agreed to take the test, objected, or merely acquiesced. The State asks us to presume based on this record that the defendant deliberately got into Chief Murray’s vehicle because he willingly agreed to submit to a test he felt free to refuse. We cannot find the waiver of an important constitutional right based on these circumstances. Moreover, even assuming the defendant did anything to unambiguously convey consent, the surrounding circumstances indicate that any such consent was not voluntary. He was transported to the hospital for the test by a uniformed police officer. The officer remained with him at all times, even when he went to the restroom to provide a urine sample. Deputy Ash had the defendant’s vehicle towed from the scene of the accident to be stored until Deputy Ash completed his investigation. We do not believe that a reasonable person confronted with these circumstances would feel free to leave the hospital or refuse to take the test. Considering the totality of these circumstances, we find that the State failed to meet its burden of demonstrating that the defendant voluntarily consented to the tests. 625 ILCS 5/11-501.6(a) (West 2010). The statute, by its express terms, applies only if the defendant has been arrested for a violation of the Illinois Vehicle Code when asked to submit to testing. We agree with the defendant that this condition was not met in this case. There is no dispute in this case that Deputy Ash did not issue any traffic citations to the defendant until two days after he directed the defendant to submit to the test. The defendant was seized within the meaning of the fourth amendment when he submitted to the tests, but he was not under arrest for a violation of the Illinois Vehicle Code as required by the implied consent provision. We read this section as holding that if a test is otherwise proper under the fourth amendment, its results are admissible. We hold that before a motorist may be found to have impliedly consented to this intrusive search, thereby waiving an important constitutional right, he must be under arrest for a violation of the Illinois Vehicle Code. The results should have been excluded.